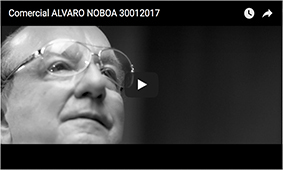 Alvaro Noboa is a very succesful businessman that has worked for the welfare of Ecuadorians in need for more than 30 years. He has worked very hard with more than 100 companies in Ecuador and around the world, contributing to the progress of Ecuador. Alvaro Noboa is an honest, succesful, and visionary man with very high moral values, and, mostly, a Christian vision of helping others through the Crusade For a New Humanity Foundation.